Packaged in 5 per pack, you get an assortment of colors for every pack. Once you light up the SPARKLER, you can clearly and visibly see the different colors in the Flame as they burn, so this makes them the pefect SPARKLER to use for certain celebrations. Check out the new way to totally entertain the party goers and guests at your special function,Bottle Service, Birthday, or event!These Champagne or Cake Bottle Sparklers add a special touch by actually sparkling and burning in Colors. 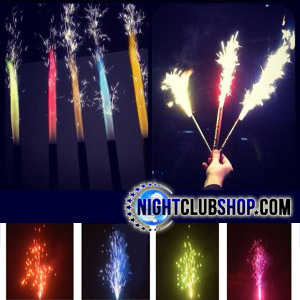 These Colored Sparklers are also longer lasting and will Sparkle and Burn for Approximately 50 seconds each which gives them longer burn time to sing happy Birthday if placed on a birthday cake (Spiked on) or a longer burn time if placed on a Bottle Clip for Bottle Service and Bottle delivery, and walking the Bottle over to the desired table while the Sparklers are lit. Packages of Color sparklers come in 5 (Five) Sparklers Per Pack, and you get an assortment of 5 colors for every pack.